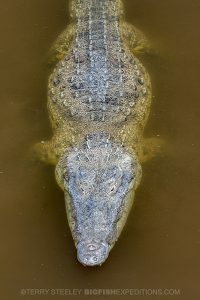 Abundant with wildlife and known only to a handful of well-informed travellers, the isolated fishing village of Xcalak remains totally unspoilt by time and is the gateway to our American crocodile adventure. 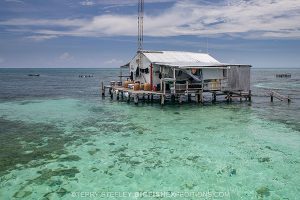 Located 400km south of Cancún on the Mexican Caribbean coast; our journey time to the remote village was close to 6 hours, but well worth the wait as we feasted our eyes on the rickety wooden buildings, white sand beaches and tranquil blue waters of the Caribbean ocean. Our hotel is on the beach in the heart of the Xcalak National Marine Park (Parque Nacional Arrecifes de Xcalak). 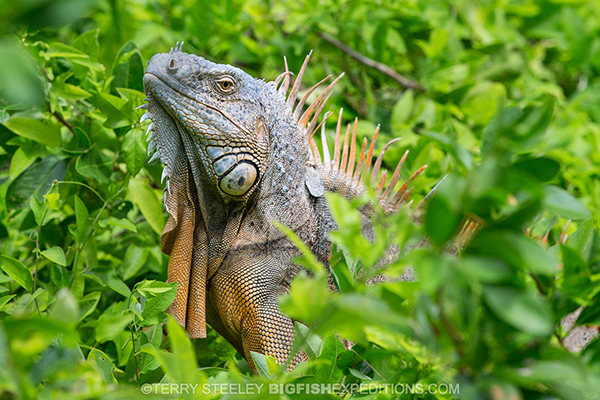 A huge protected area of land and sea extending up to 17,949,456 hectares. 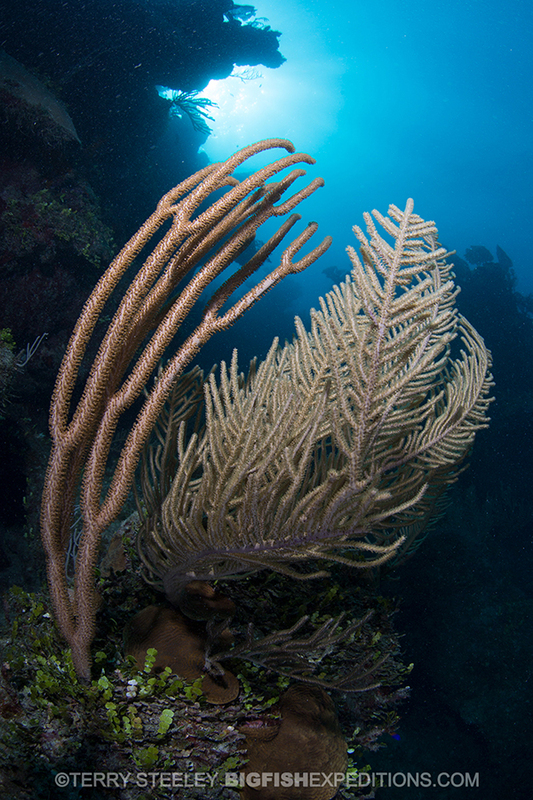 It’s an exceptional spot and only a short boat ride away from some of the best diving in the Costa Maya. Although, kayaking and snorkelling from the shore is impressive too. On our first full day, we enjoyed two guided boat dives exploring Xcalak’s spectacular reefs, La Poza & La Chimenea. The water was a toasty 29˚C/84˚F, 3mm ‘shortie’ temperature for all but one or two. 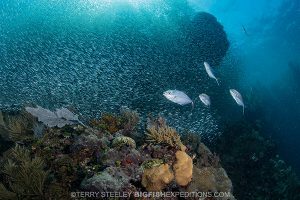 Both dives were excellent and allowed us to see large schools of tarpon, jacks, octopus, lobsters, a turtle and a bajillion silver-sides. 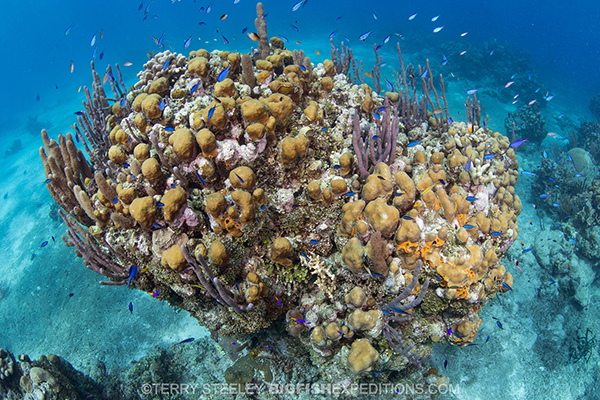 The reefs in the marine park are vibrant and healthy, an absolute joy to dive. It’s easy to understand why the few who visit describe it as a ‘diver’s paradise’! As anticipated, our second day’s weather was exceptional! Awakening to flat calm seas and a warm inviting sun, this was the day that our American crocodile adventure would begin to take shape. There was a lot of excitement amongst the group as we waited eagerly for our early morning pick-up. But it’s fair to say that there was some apprehension too, for the task ahead. 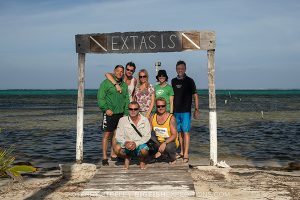 With our gear packed onto the boat we gathered under the jetty sign ‘Extasis’ (Ecstasy) for our first team photograph before heading out across the ocean. The journey time to the atoll would normally be 2 hours and the crew have shared horror stories of lumpy wet 4 hour crossings when the weather is unkind. Our weather conditions were phenomenal and we made the crossing in little more than 1 hour, taking the initiative to sun bath along the way. 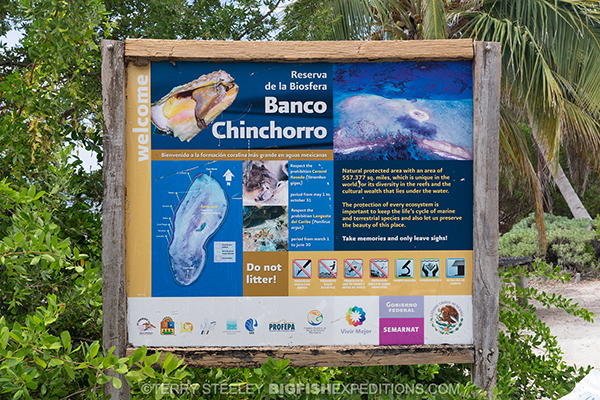 Banco Chinchorro is one of the jewels of the Mesoamerican Barrier Reef System. 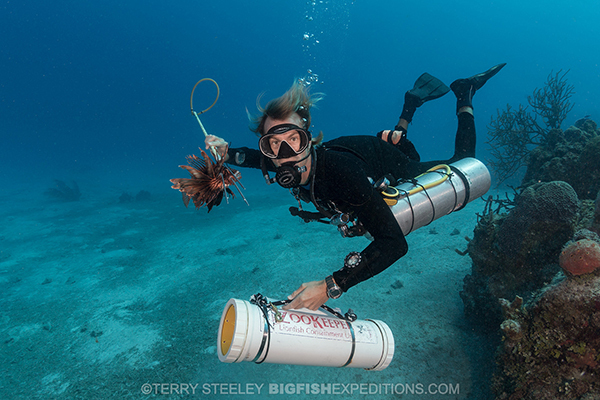 The MBRS extends from the southern half of the Yucatan Peninsula down to the Bay Islands of Honduras, includes the second longest barrier reef in the world, and is unique on account of its size, its array of reef types, and the superabundance of corals. Chinchorro is a destination that instantly makes people feel uplifted and happy. It’s an area of outstanding beauty and can be immensely overwhelming on a first visit. 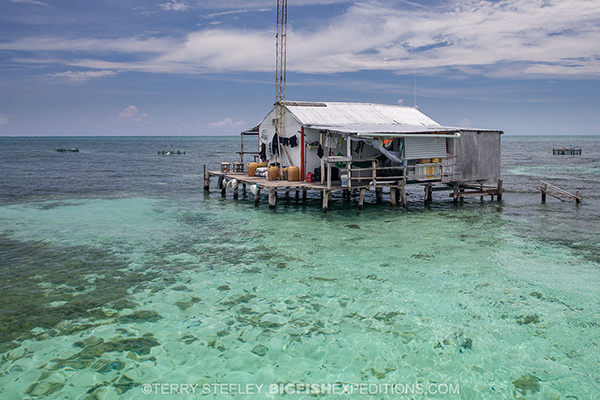 We stayed close to the island of Cayo Central in a practical purpose-built stilted fisherman’s house. It’s nothing like the luxurious Maldivian water bungalows of the Indian ocean. 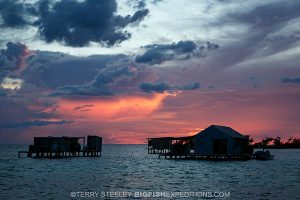 That said, the quirky hut is utterly charming and the perfect location to compliment our 3 day extraordinary adventure. Within the limited space, there are areas designated for cooking, sleeping and washing. From the terrace, you can observe schools of fish, stingrays or crocodiles moving around the shallow turquoise waters below. And, during sunrise and sunset, the hut is ideally positioned with panoramic views of both the start and conclusion of the day. Experiences that could only be enhanced with a frozen Margarita in hand. From the moment we arrived, we wasted no time unloading the boat and making our temporary home comfy. 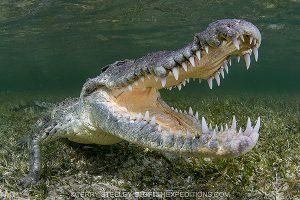 Captain Moi began cooking lunch; whilst Captain Gallo began emulating the fishermen cleaning their catch to seduce the crocodiles close. 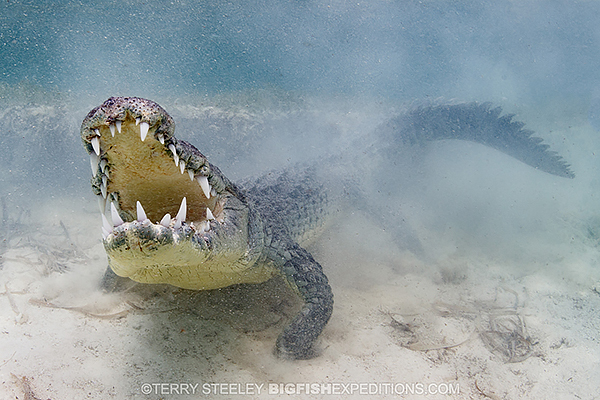 For years, crocodiles have associated the splashing of water and a rhythmic chopping sound with a free meal. 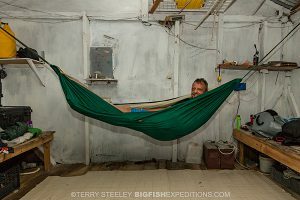 Hammocks were strung, bags unpacked and guests eagerly tested their cameras. For an off-the-grid location, we were incredibly well-serviced. We had enough ice to keep our chilled foods and drinks cool for the duration of our stay. A petrol generator for charging batteries (if required) and bottled gas to ensure that our meals were cooked to perfection. For a second year, our American crocodile trip coincided with the Caribbean lobster season. You’d struggle to buy a decent lobster on 5th Avenue for less than US$85, but in Chinchorro we negotiated for 20 lobsters from the local fishermen for a total purchase price of US$55. Cooked in garlic butter echoed last year’s ‘freshest catch of the day’. Starting with a full briefing of ‘croc etiquette’ and safety, we were told that there had been many new crocodiles visiting during the year. Their behavior was completely different to many of the known favourites. Some of the smaller crocodiles were really feisty, whereas, the larger ones by stark contrast were über chilled and lethargic. Thankfully, we didn’t have to wait too long before the new faces inquisitively arrived. 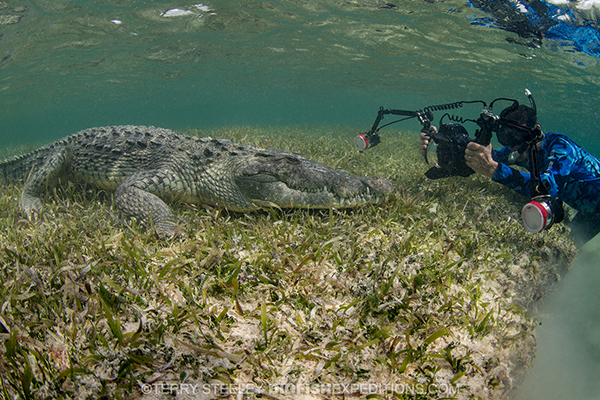 Our crocodile interactions were marvellous, bucket list moments in life. 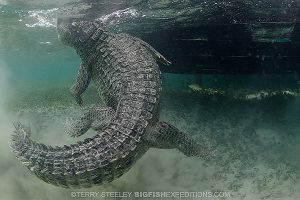 Each day, we enjoyed many hours in the water with single crocs, pairs of crocs and occasionally rowdy or fighting crocs. 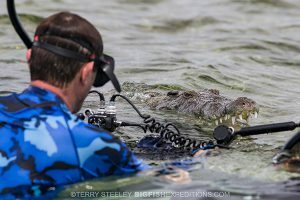 Snorkelling alongside the ‘prehistoric’ looking American crocodiles was a huge privilege. For many, an unforgettable event. 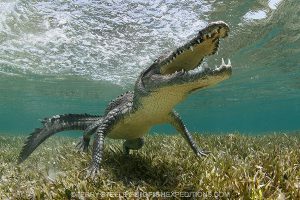 Crocodiles are like teenagers and tend not to rise too early. So, we used the mornings as a perfect opportunity to explore Chinchorro both above and below the waves. Each day started with a lazy dive. Twice we dove the splendid walls of the outer atoll; bountiful marine life and colourful coral, positive signs of a healthy reef ecosystem. These dives also allowed us to stock up on Lion fish. 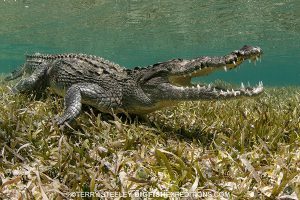 Crocodiles love the taste of Lion fish and we make a small contribution to help the ocean too, ridding the atoll of an invasive predator. 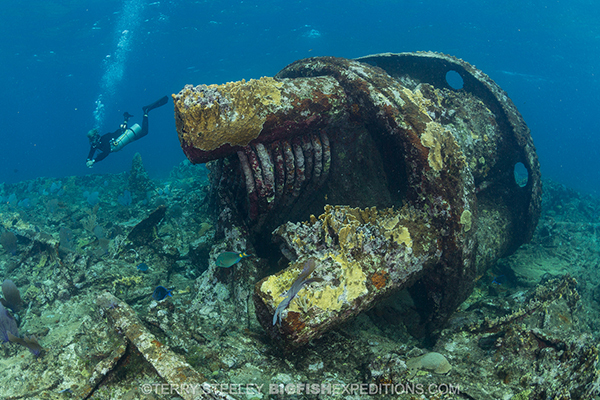 Chinchorro has been dubbed by the local fishermen as ‘the ships graveyard’. Decades of poor decisions and bad weather having contributed to the final voyages of countless vessels large and small around the atoll. 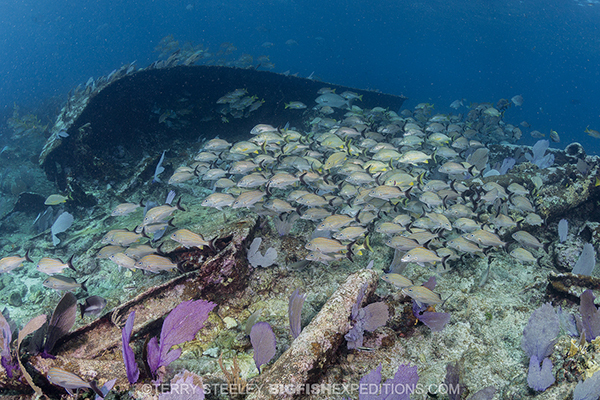 Our third dive was on the wreck of the SS Ginger Scout. 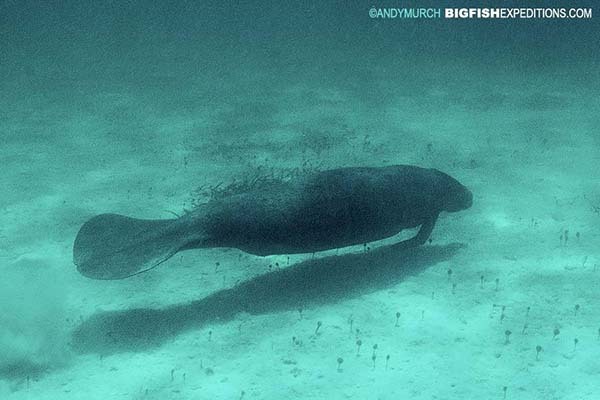 Battered by the elements, Ginger Scout is scattered over the sea bottom in only 6m/18ft of water. 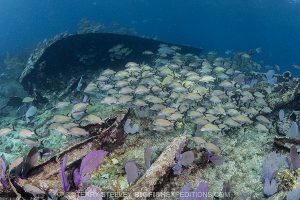 The dive was a little bit surgy but hugely rewarding, vast schools of fish, early morning light beams and colourful fans amongst the highlights. An island visit to Cayo Central is mandatory. 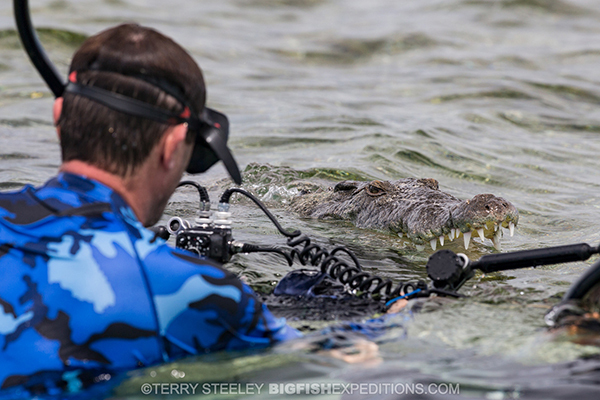 It’s required during our visit to let the rangers know that we’re actively snorkelling with the crocodiles. However, our island excursion also gives us the freedom to meet the endemic giant iguanas. And, they are everywhere. 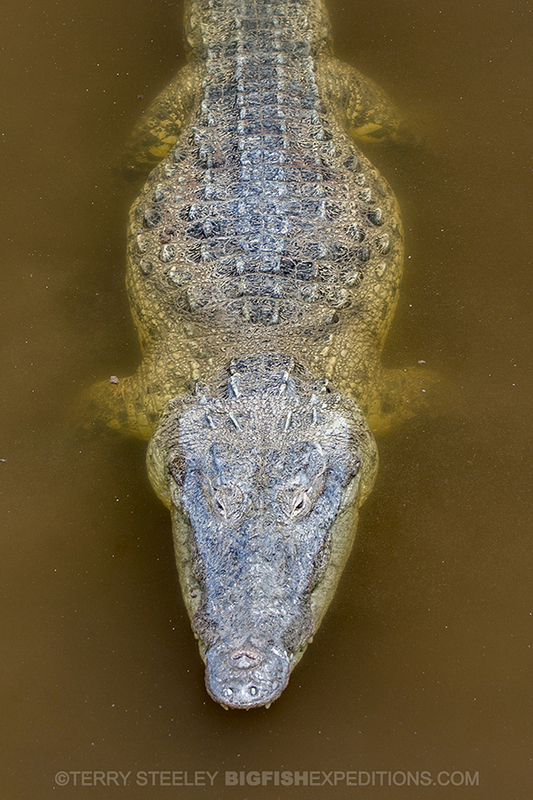 Measuring up to 6ft in length, they’re an interesting contrast to the crocodiles we had been swimming alongside. 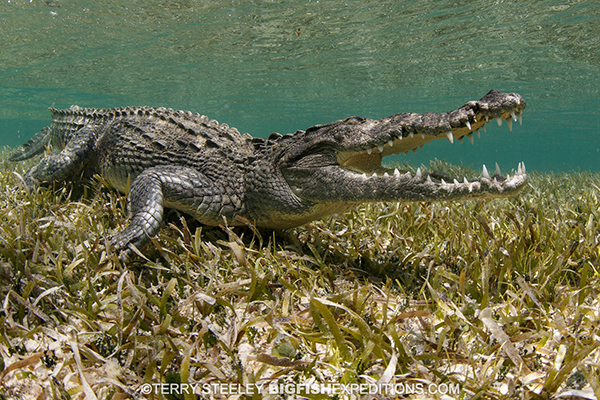 Walking around the island we found more crocodiles basking in the shallow waters of the mangroves. These crocodiles are known never to visit the fisherman’s hut, choosing to live their life amongst the mangroves. 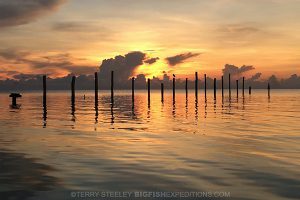 There are many areas around the island that can only be accessed by boat. Photography and video opportunities are bountiful at Chinchorro and we made sure that we didn’t miss a single one! 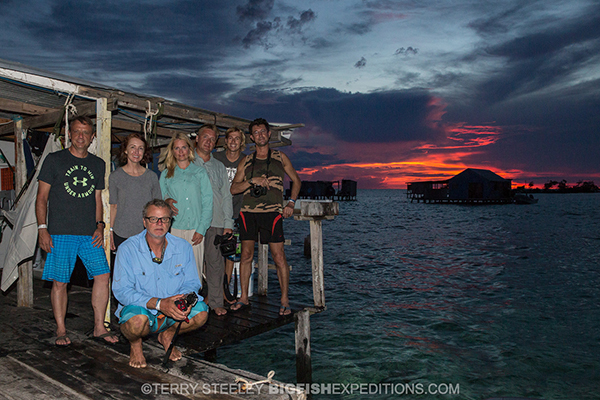 We returned to Xcalak with time to enjoy four more reef dives and appreciate the fascinating night sky. 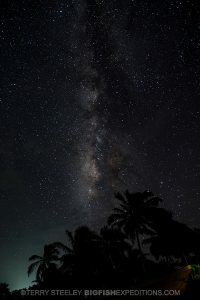 There’s seldom cloud cover in Xcalak or Banco Chinchorro and the light pollution is very limited. Shooting stars are frequently seen and the Milky Way is just so beautiful. Who wouldn’t want to sit outside and relax? 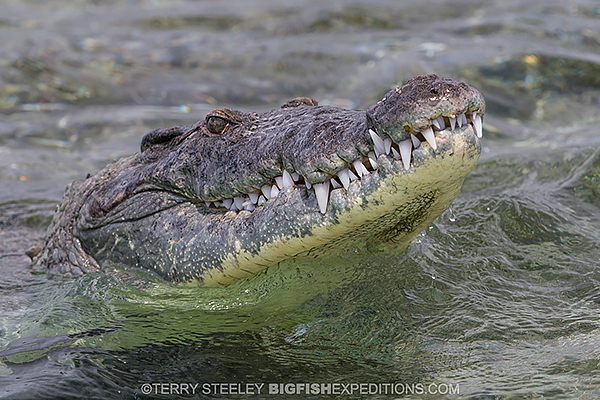 The Big Fish Expeditions American Crocodile Expedition, is an epic trip, very different to others on our calender. A collection of so many unique experiences that always delivers a smile.